OCinside.de today published a new reader review. 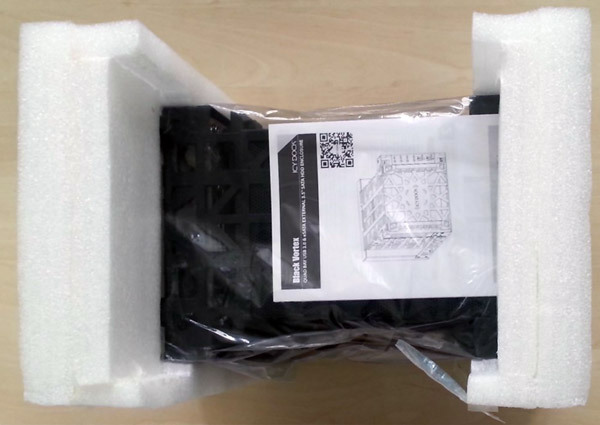 This time MisterY is testing the Icy Dock MB174U3S-4SB Black Vortex from Cremax. 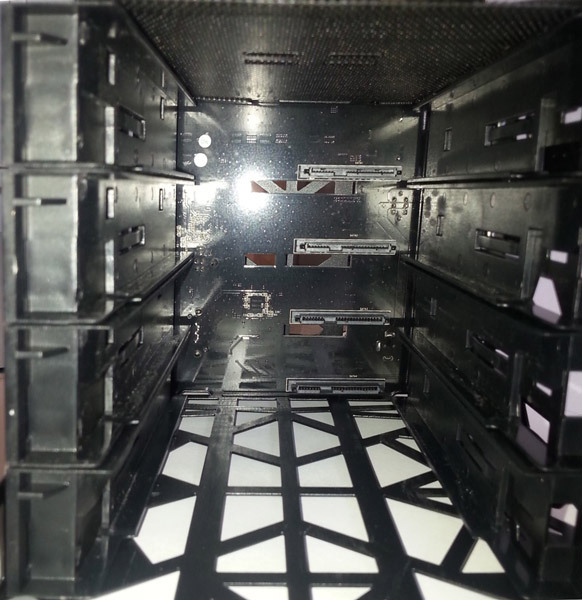 The external drive enclosure with dust filter and fan control offers space for up to 4 hard drives, which can either be connected via USB 3.0 or eSATA. Take a look how this external hard drive enclosure performs in the reader review, that can be operated by the way also internally. Many know this problem: Just buyed a NAS or the (small) case you ever wanted, but suddenly you recognize that you would like to add some HDDs. Or you have a Smart TV and you just don't like to change the HDDs every time. 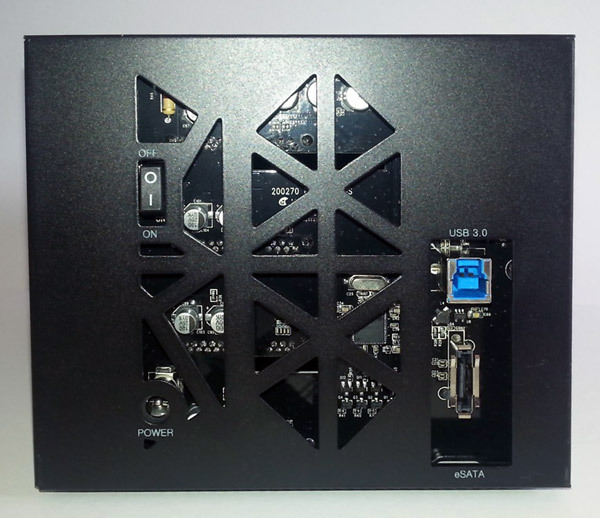 Maybe you have a router with an USB-port and you may want to use it as a homeserver? 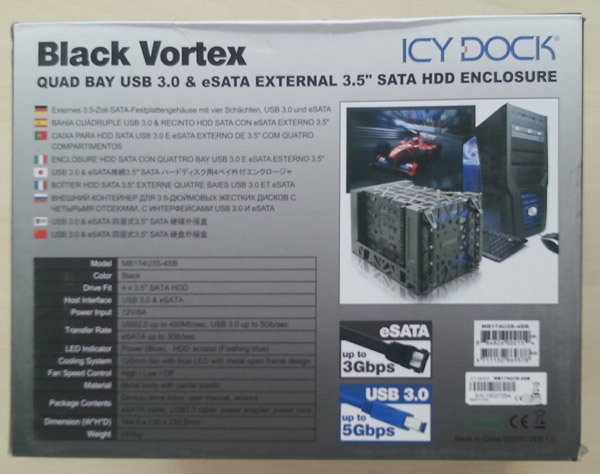 Icy Dock has a new Black Vortex, which could solve all of this problems, the "Black Vortex MB173U3S-4SB", which can be connected by USB 3.0 or by eSATA (portmultiplier is needed). At the time of the test, you can buy it for around 110 euros. Attention: Don't mix it up with the Black Vortex MB074SP-B or with the Black Vortex MB074SP-1B. 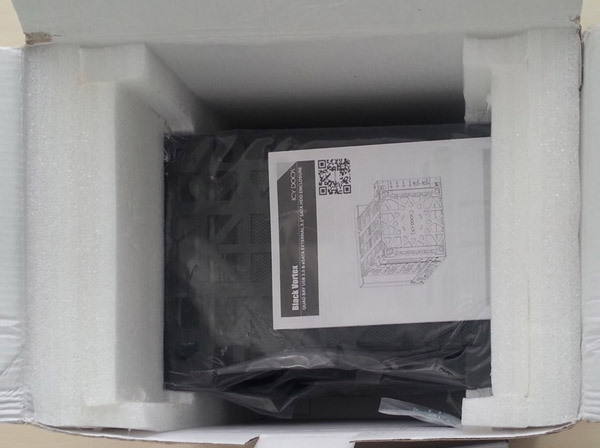 A big thanks goes to Cremax/ICY DOCK for sending a test sample. 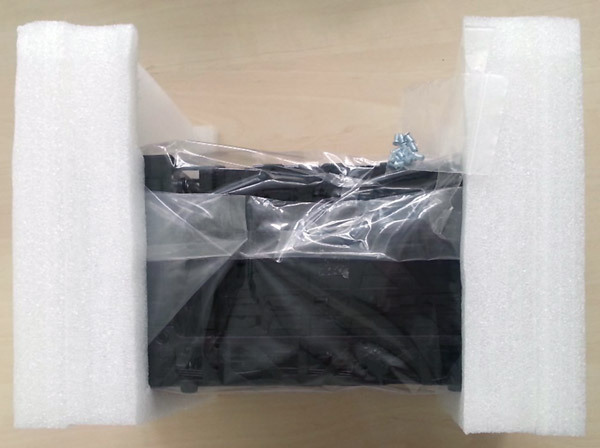 The package contains the most important features of the Black Vortex MB173U3S-4SB. an USB 3 and an eSATA cable and many screws. A small manual, which can be found in icydock.com is part of the accessories, too. 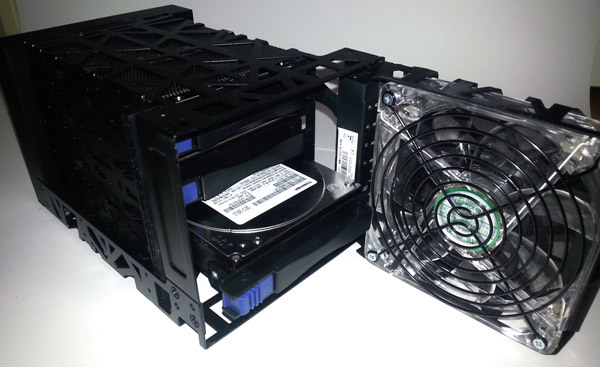 The power of the power supply is moderately large dimensioned and has with 6A at 12V enough reserve for the HDDs. It doesn't heat up much during this test. 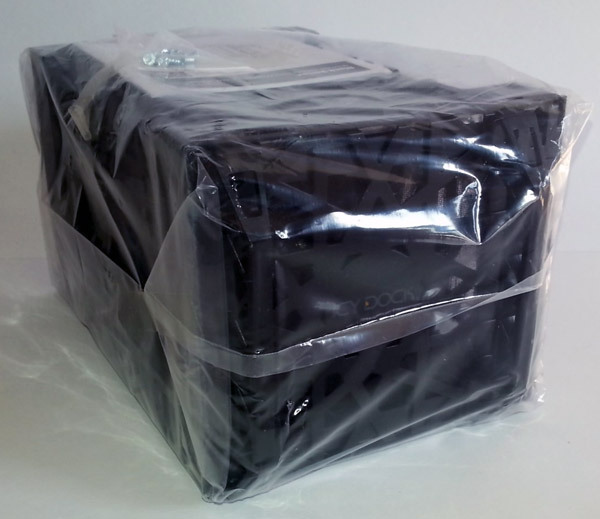 The Black Vortex MB173U3S-4SB fits in 3 5.25" bays, but has although rubber pads for an external use, respectively it is an external case with the option to use in internal. 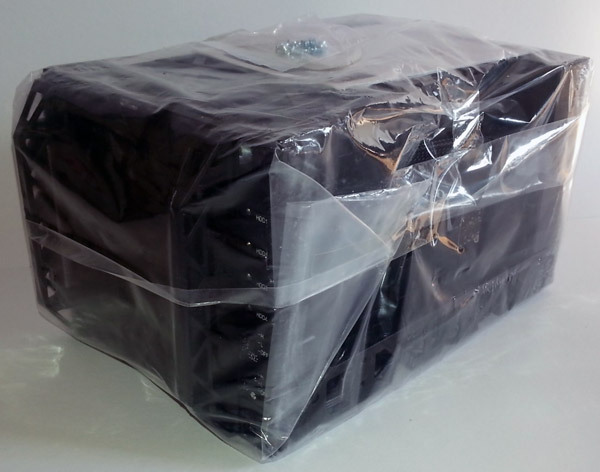 The Black Vortex got its name of the color and the airflow structure of the case. 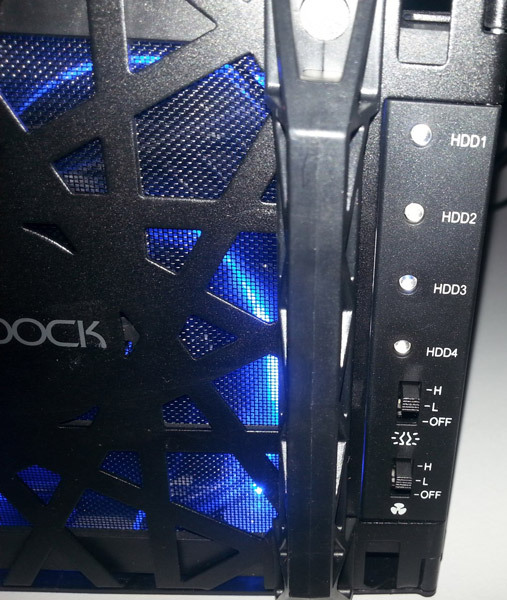 On the front are 4 LED-Indicators for the Power state and the HDD accesses. 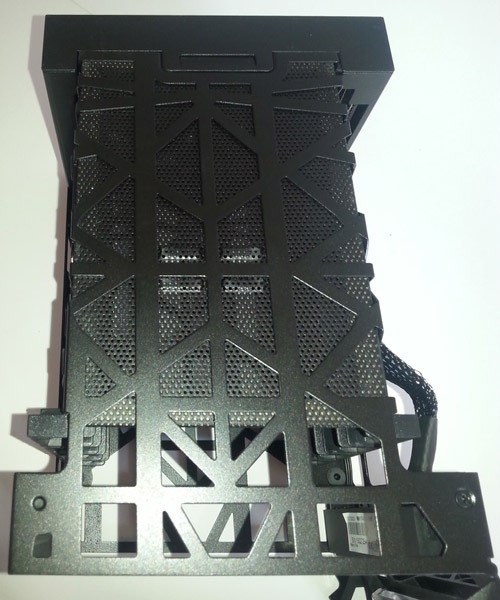 The back has the power over the two data connections (USB3 and e-SATA) and a power switch. Here, too, the open design will be continued. The processing is consistently very good to look at. 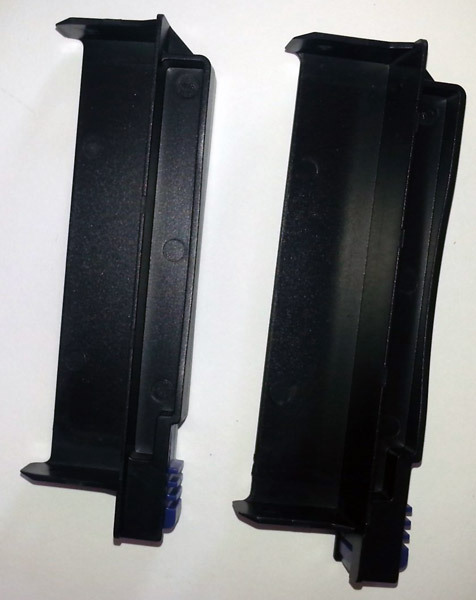 Also there are two handholds to take the Black Vortex MB173U3S-4SB out of a Case or to open it. 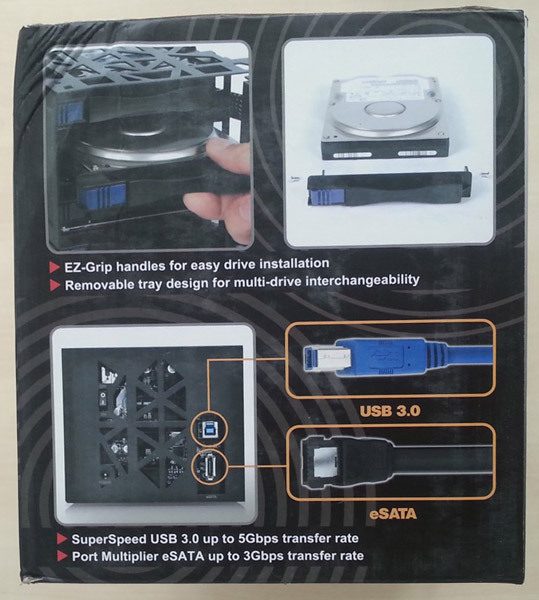 Total 6 so-called "EZ grip" are included, so that also the hard drives can be changed quickly. 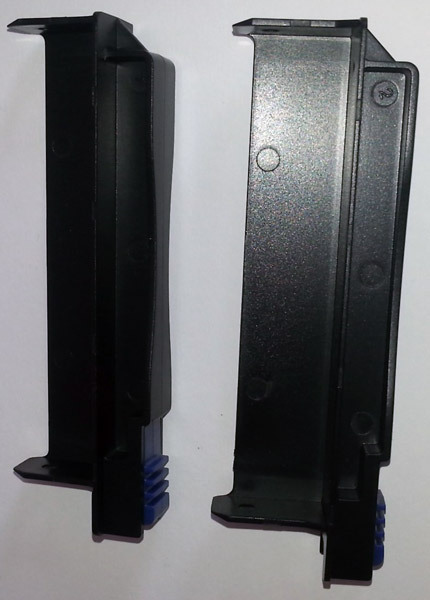 Only 2 screws are used to mount the HDDs to the EZ-Grips. 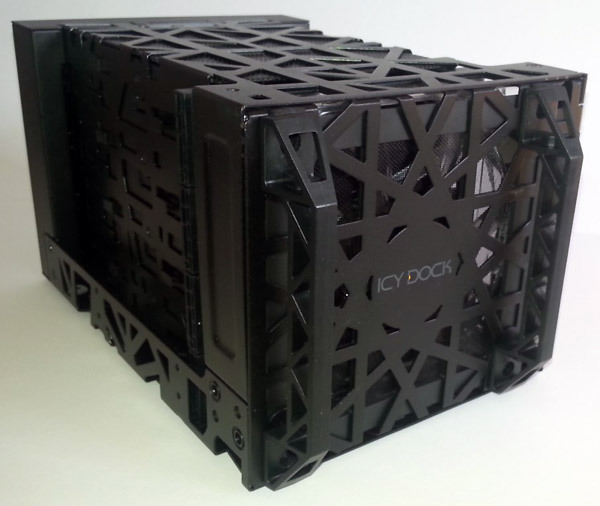 They serve as a handle and lock the hard disk into the Black Vortex. 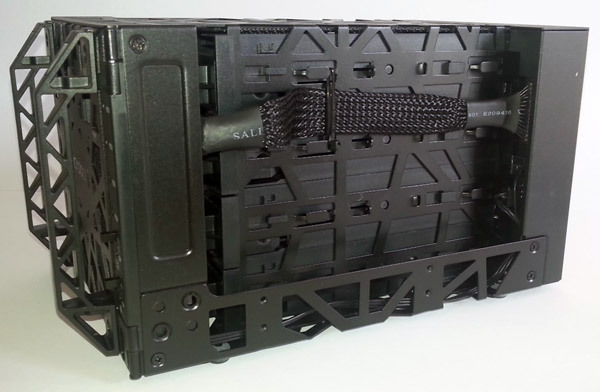 the open structure of the case can be seen. But there is no reason to worry about for dust getting in there, because the holes are used as an outtake vent, and not for intake. 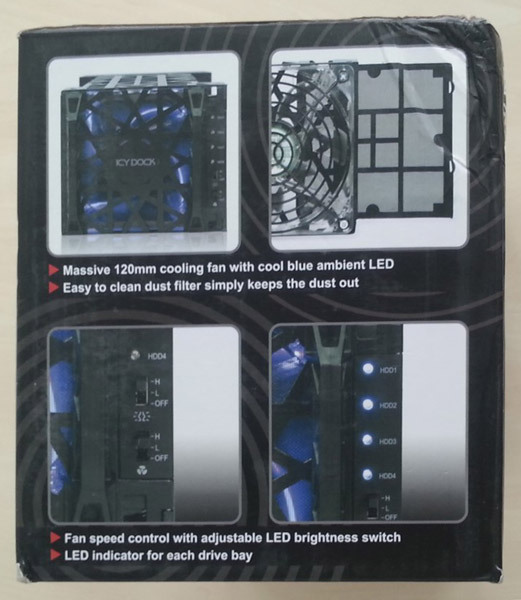 The fan itself has a dust filter. 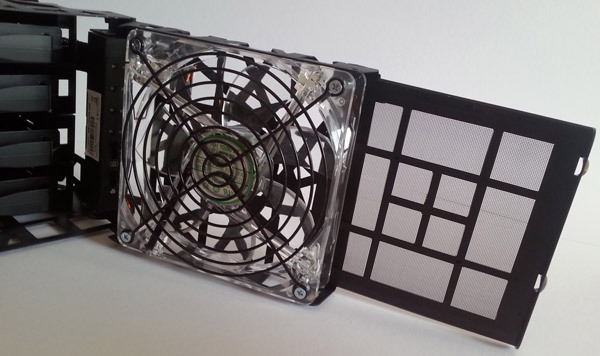 The fan is controlled to be switched off, low or high rpm. Even the LEDs can be controlled or shut off. 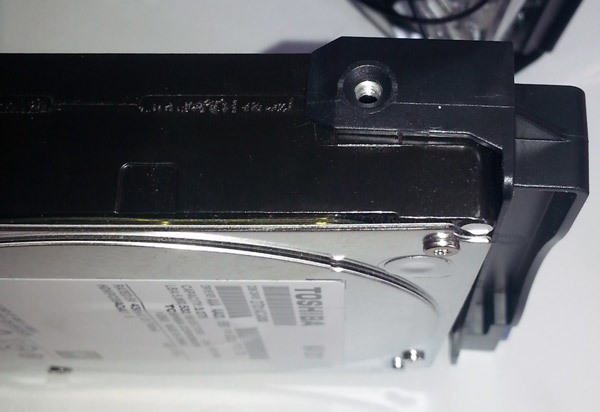 The fan can be replaced with almost every 3 pin 120mm fan. 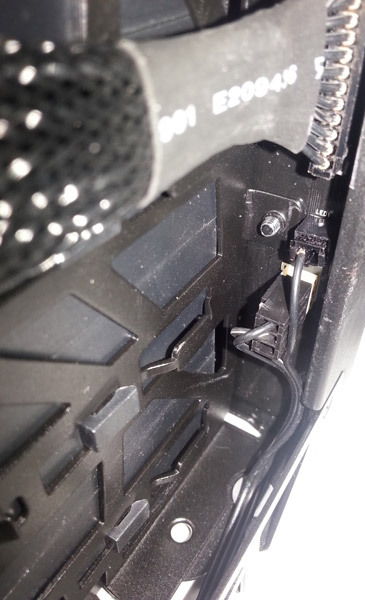 But keep in mind, that then the LED-Controller isn't functional anymore, because the preinstalled Fan has two separately connectors. 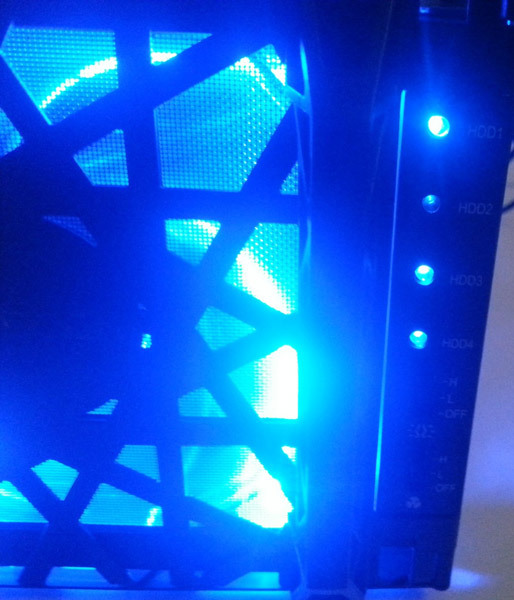 With 4 HDDs and connected to USB3 the Black Vortex MB173U3S-4SB has been tested. First for one single S-ATA III HDD a read benchmark was made. 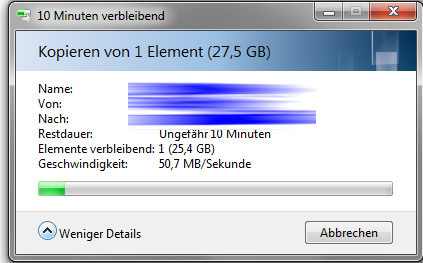 As you can see, the data rate is constantly and getting, like all HDDs, lower at the end. The HDD isn't slowed down because of the Black Vortex. Also the Access time is normal. 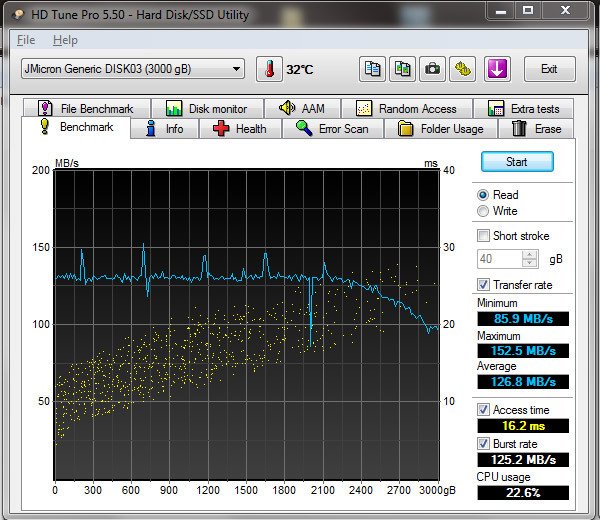 But a read-test of 4 HDDs together you can see the bottleneck of USB3. The interesting thing is, that the HDD in slot 2 is the dominating HDDs and has more stable and higher data rates than the other HDDs. 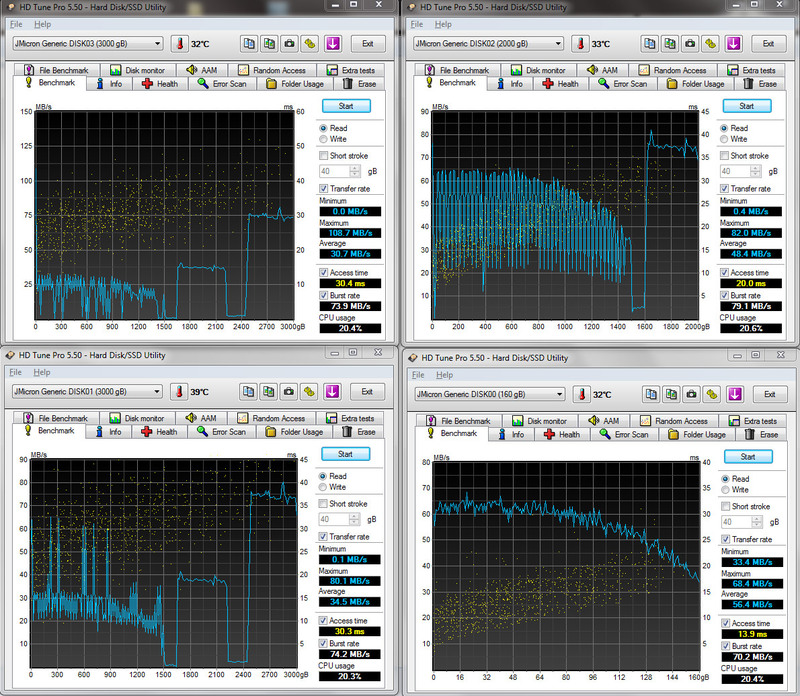 The jumps in the graphs are a result of the end of the test of a HDD. Copying a big file from one HDD of the Black Vortex to an internal one, a transfer rate of about 150 MB/s with windows explorer and total commander can be reached. Slower is a copy from a file of one HDD of the Black Vortex to another HDD in the Black Vortex. A data rate of 50 MB/s (Windows Explorer) respectively 75 MB/s (Total Commander) can be reached. USB 3 is here the bottleneck, too. 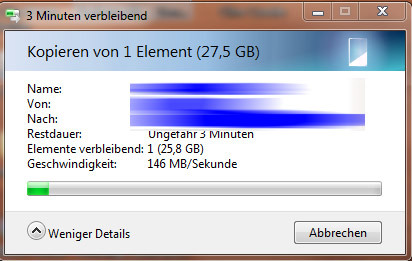 Another drawback of USB3: you're only able to eject under Windows the whole Black Vortex, not every single HDD. Not even at USB2. 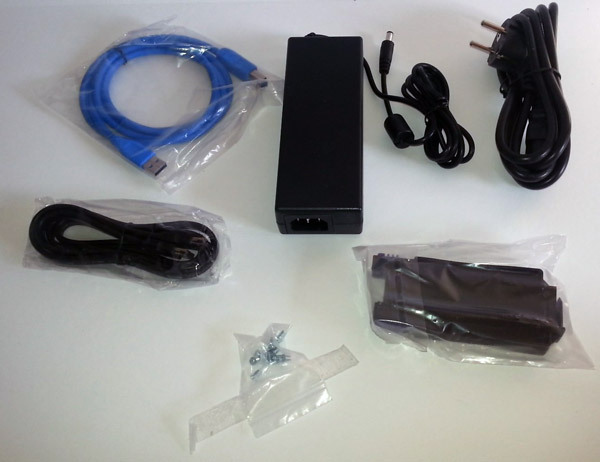 Thus, the Black Vortex MB173U3S-4SB is not Hot-Swap able with Windows 7; Windows Server 2012 by using USB. 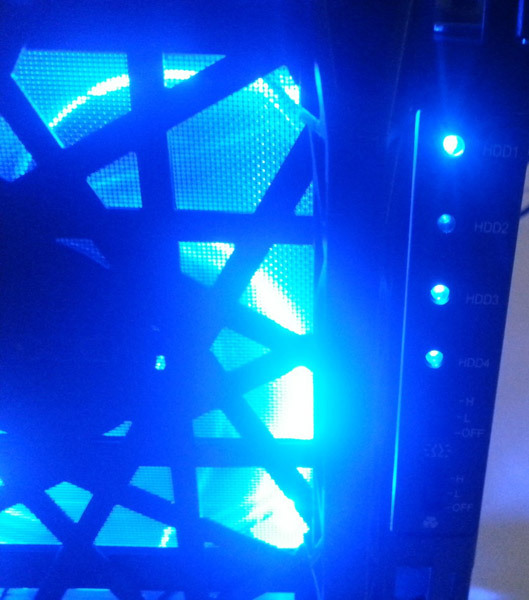 After 2 hours of testing, the temperatures of the HDDs were moderate between 37°C and 41°C. The noise level is constantly low. No vibrations can be heard. 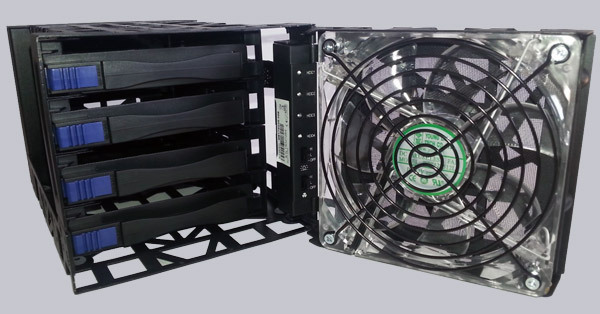 The cooling capacity is good as well and the noise keeps well within limits. The housing is well decoupled, there is nowhere any form of unwanted vibration noise. Thus the Black Vortex MB174U3S 4SB is compatible and suitable for quiet home theater. The power supply consumes 6 watts out of the power point even when the Black Vortex MB173U3S-4SB is switched off. 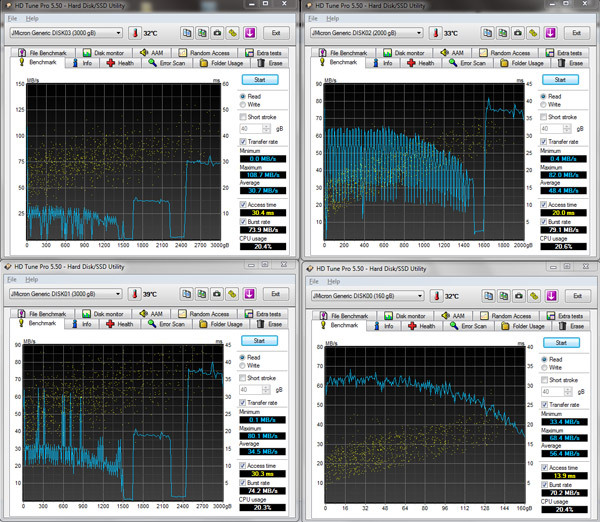 With all HDDs idle the power consumption is around 16 watts, what can be more than some desktop PCs consumes. With spinning HDDs the power consumption is between 33 and 38 W. With access to 4 HDDs it rises up to 45W. The test-computer (Athlon II X4 630 with 6 HDDs) consumes only 25 W more. By the way, the spindown of the HDDs has some failures: Neither Win 7 Prof 64 SP1 (3 PCs, Intel and AMD) nor Openmediavault 2.1.9 and a Zyxel NSA310S was able to spindown the HDDs, while the internal HDDs went to sleep. With the help of some tools, it was possible to spin them down manually, but not automatically. Only a new installed Windows Server 2012 R2 could bring the HDDs to spindown, but only all HDDs at once. This, while a Copy-Test from HDD A to HDD C and D, led to spindown of the non-used HDD B, followed by HDD A, C and D (while copying!) and started again afterwards. After this, it was not possible to access HDD A, C and D anymore, because of destroyed partition tables. If this is a failure of Windows or of the Black Vortex MB173U3S-4SB respectively of the USB 3 controller (Jmicron) in the Black Vortex, cannot be figured out. 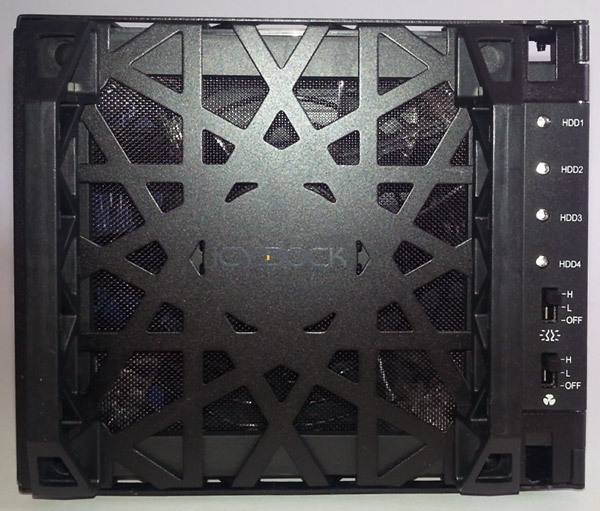 The Black Vortex MB173U3S-4SB is a solid, well made external 4 Bay Case, which can also mounted internally. The 6 EZ-Grips allows a rapid and easy change of the HDDs, but for doing that with USB 3.0, the Black Vortex has to be shut off. 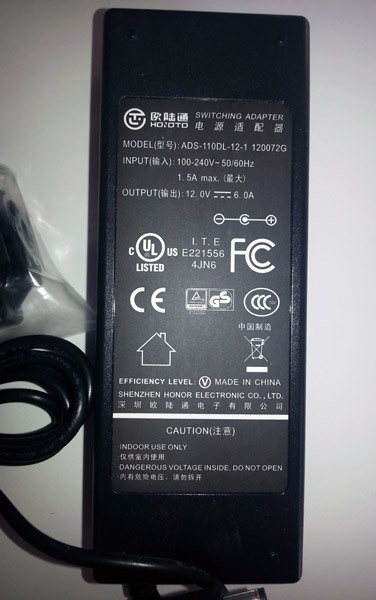 The noise level is low, the LED controller useful. The transfer speed is USB3 typically good for access to one single HDD, but gets a bottleneck, if two or more HDDs are used at the same time. The power consumption is a bit high. The SpinDown issue under USB 3.0 is a point of criticism, it should be recognized, if you don't like to permanently run the hard disk drives, nor connecting with e-SATA. The price is for an external 4-Bay enclosure quite good, especially in light of the very good processing. 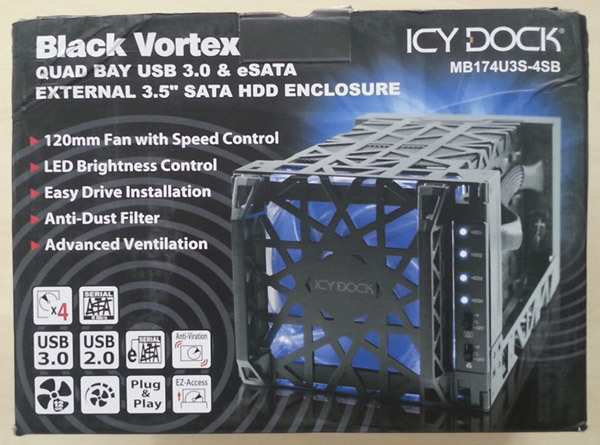 Here you can buy the Icy Dock MB174U3S-4SB Black Vortex.